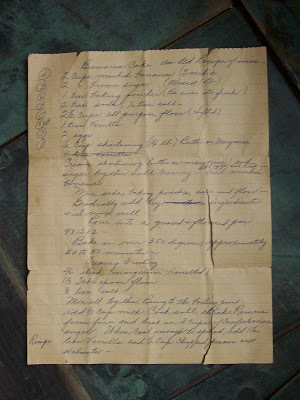 Last week my mom gave me an old banana cake recipe she had from my Grandma. She actually got it off of my sister who said she’s had it for a while. It was with some old photos my aunt gave her when grandma passed away. As I was making this cake I imagined my grandma making it for many different family gatherings. I sure miss her. The best part is, it is written in her handwriting. I love old family recipes. I hope you enjoy this one too! Preheat oven to 350 degrees. Grease and flour a 9″ x 13″ pan. Cream butter and sugar together. Beat in eggs one at a time until creamy. Add mashed bananas. ana mixture, until well combined. Pour in prepared pan. Bake approximately 40 to 50 minutes. Let cool slightly and spread on frosting. 2 1/2 Cups Confectioners Sugar. Mix butter, flour and salt together. Bring to boiling point. Add milk and cook until thick. Remove from heat and beat in confectioners sugar. When cool enough to spread, add vanilla. 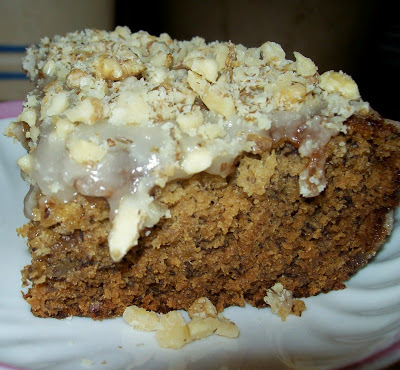 I think I did this next part wrong but I poured the icing over cake and spread it out then added the chopped walnuts on top before icing completely cooled. I think what your suppose to do is add the nuts to the icing then spread it on cake. Either way I think you’ll get the same taste.